This fence is known by a lot of names: box wire, woven wire, non-climb, etc. We will use the term woven wire to describe any fence that has vertical and horizontal wires connected to form a grid. These grids can be many different sizes depending on the distance between the wires. Woven wire’s advantage over all other fences is its security; woven wire fences are specifically designed to keep animals in or out. A tight grid of wires nailed securely on sturdy posts can keep something as small as a rabbit out and or keep an animal as big as a horse in. The only way animals can get through is if the woven wire fence is actually broken. If security is your highest priority then this should clearly be your fence of choice. Five- to six-inch round treated posts, just like those used with the high tensile fence, is optimal when installing woven wire fencing. The primary difference is that the posts are normally spaced much closer together for maximum fence security. Post spacing varies on the size of the wire’s grid. For example, 12-foot post spacing with the 13-48-3 and the 2”x4” non-climb makes excellent choices for horse fence. The numbers: A 13-48-3 means that the wire has 13 strands of wire running horizontally, it is 48” tall, and the upright wire or stays are space every three inches. The 2”x4” non-climb fence is simply a grid of boxes that are two-inches wide and four-inches tall. Woven wire comes in many different shapes and sizes but there are only two primary categories: high tensile woven wire and non-high tensile woven wire. The difference is that high tensile woven wire has been through a specialized process that gives it two thousand percent more strength and also significantly increases its elasticity. This does not necessarily mean that regular wire is not a good choice under normal conditions where your fence wire won’t be tested to its maximum tensile strength. However, this extra strength will keep your fence stretched tight and looking young for many years. Woven wire fences are one of the most secure and versatile fences on the market. It is well-suited for horses as they can’t get their feet tangled in it, and it is also very visible for a wire fence. It is almost impossible for cattle to get out without first destroying the fence—not a walk in the park. This fence also works great for keeping deer out as the wire can be bought to eight-feet high. Woven wire puts strain on the posts so it is important to brace the fence by placing posts in the ground eight feet apart and four feet into the ground. A horizontal pole is then run between these two posts, reinforced by a diagonal wire that holds the brace system together. The most popular woven wire fence design is a 13-48-6 fence with posts spaced every 12 feet. 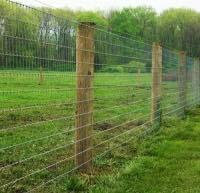 Woven wire fences are often used for both cattle and horses, is popular because it is extremely secure. Animals simply can’t push their way through the woven wire fencing. ProFence employs experienced professional woven wire fence installers. Our fence installation team has years of experience installing fencing on many different types of terrain. A woven wire fence can last a lifetime. It all starts with quality materials and an experienced woven wire fence installation team, ProFence provides both.